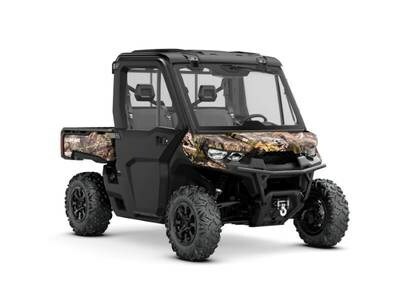 2019 Can-Am Defender XT CAB HD10 Mossy Oak Break-Up Country Camo FORECAST GETTING IT DONEInspired by those who drive it, the Defender XT CAB is the most complete utility vehicle Can-Am has made. Tough, capable, and clever features allow the Defender XT CAB to get the most out of any weather in comfort, style, and ingenuity. Features may include: FULL CAB ENCLOSURE ALL-SEASON COMFORT Starting with a tilt-up windshield and wiper kit, doors with electric opening windows in front and hinged window opening in the front, and ending with a useful sliding rear window. HEATER KIT WARMTH WHERE IT COUNTS When you’re working or hunting outside in colder climates, escape bone-chilling temps by climbing into a toasty warm cabin and firing on the integrated heater—yeah, it's as good as it sounds. Rotax HD8 or HD10 V-Twin HEAVY-DUTY ROTAX V-TWIN ENGINES The Defender XT CAB package offers two very capable true-work powerplant options. The 72-hp Rotax HD10 V-Twin is specifically tuned for serious work but also offers 61 lb-ft torque and peak torque at lower RPM for optimal delivery for recreational use. The work-focused Rotax HD8 V-Twin delivers 50 hp and 50 lb-ft torque for tough tasks. DYNAMIC POWER STEERING STEERING YOU RIGHT Dynamic Power Steering (DPS) is tuned for utility while returning renowned Can-Am responsiveness for recreational riding. DPS improves steering feel in slow-speed working situations and in more technical terrain. It's also designed to offer less assistance at high speeds and more assistance at low speeds. 4-MODE TRACTION SYSTEM GROUNDED POWER The Visco-Lok QE† front differential combined with the lockable rear differential offer a 4-mode traction system providing multiple choices for varying terrain or tasks. Users, via a separate front-and-rear toggle switches, can select between a 2x4 open rear differential for tight turning and turf protection, a 2x4 lockable rear for improved 2WD traction, a 4x4 open rear for more maneuverability in rugged terrain and a 4x4 locked rear for maximum traction. The rear differential is gear-on-gear to the transmission for better response, no maintenance, better efficiency and fewer components.